Your vehicle relies on different fluids like oil, coolant, and other lubricants to keep components working properly and your car running safely. If you notice fluid spots in your driveway, it’s good to know what they mean. The driveway repair experts at Veir Corp in Sterling, AK, share what each color liquid says about your vehicle. Ranging from amber to black, an engine oil stain smells faintly of gasoline and indicates a leaky seal, loose oil filter, or cracked oil pan. Repair quickly to avoid moisture and dirt getting inside your engine. You also run the risk of your engine not having enough lubricant, which can affect function. A reddish hue means the power steering system is leaking. This area needs to be sealed, and any liquid indicates your levels may be too low for power steering to work. The power steering pump will also fail and affect driving, leading to a costly repair. A thick, reddish brown, slick pool with a burnt odor is transmission fluid. Visit your repair shop immediately to see where the leak is and repair quickly. Transmissions can be expensive to fix and the longer you wait, the bigger the job. A slimy, sweet-smelling green, yellow, or pink fluid is coolant. Coolant is found in different areas to maintain your car’s temperature, and spills can be toxic. Usually, the radiator is a key spot to check first, but you can pinpoint the exact leak by where it sits under your car. Windshield washer fluid looks blue and will not have a smell. It is easy to locate where the leak is coming from, especially if you notice cracks along the tubing. Beware of dirt getting in and clogging the pump and nozzles. When brake fluid first appears, it will be clear or light brown, getting darker the longer it sits. It’s slippery, and if brakes are leaking, this can cause trouble as you drive. Have your levels checked immediately for improved safety. A leaking or damaged fuel filter or line leads to gasoline seeping out. Gasoline appears clear and usually won’t stain, but the smell is strong. It is also very dangerous; never drive if you suspect a gas leak. 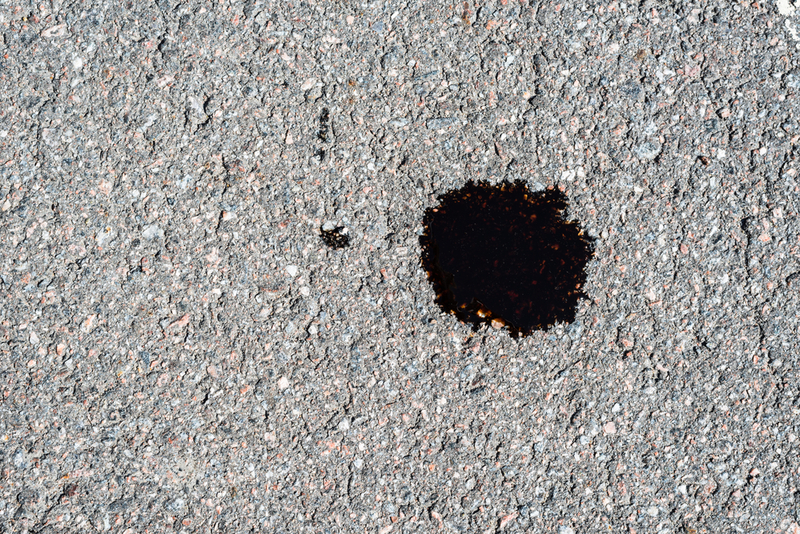 Call for towing and contact a driveway repair expert to remove this flammable substance from your pavement. Once you address the issues these leaks could cause your car, take care of the pavement the liquid has affected. For an experienced team for seal coating and pavement crack sealing in the Kenai Peninsula, trust Veir Corp. Protecting your asphalt and concrete is important, and this driveway repair company can help prolong the life of your property. No matter the size of the job, their friendly staff is ready to help. Call (907) 953-7208 for an asphalt patching and seal coating estimate or visit them online and on Facebook for more on their driveway repair offerings.